These past few weeks, we've had so much fun coming up with ideas for the three challenges at the Fall Fitness Challenge, sponsored by ABOUND. Along with our FitDog Friday co-hosts SlimDoggy and My GBGV Life, we introduced three fun challenges to help keep you and your pups fit heading into the holidays and winter months. As the #FallFitDog challenge comes to a close, this week we're taking a look at some of the great ideas you all shared. And, we hope to see more at this weekend's Blog Hop, too! But before we share some of our favorites, don't forget to enter the super ABOUND giveaway where four winners will each receive a prize pack valued at over $200! Head over to our giveaway post for all the details! Now, here's what you've been up to! Bella at Tiffany's Diamond Dogs showed off her winning form on the fun circuit they created in their backyard. Buzz at K9sOverCoffee shows off a new trick he learned that has practical as well as fitness benefits! Sharon Gilbert's pups Schooner and Skipper love to swim. Take a look! Last weekend, Rocco and his pals at Johann The Dog, had some of their own fitness fun. We headed up to Tallulah Gorge in North Georgia hoping to see some fall color. Turned out it was a little early for color, but we still had a great day and a fun hike. We'll share more hiking photos in a future post... and we hope to get out hiking again soon to catch more fall colors! 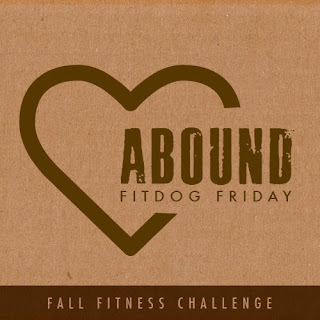 Thanks again to ABOUND for sponsoring the FitDog Friday Fall Fitness challenge and for providing the terrific prize packs. If you're not familiar with ABOUND, it was founded on the belief that pet foods could be better, not just by a little, but by leaps and bounds. They envisioned a pet food that used all-natural ingredients, contained high-quality proteins as the first ingredient, and included real vegetable and wholesome whole grains. ABOUND recently added a grain free line that more closely mimic your pet’s natural, ancestral diet. ABOUND Grain Free recipes are protein-rich and feature easy-to-digest carbohydrates, with none of the grains that some pets find difficult to digest. To learn more about ABOUND and enter the giveaway, head over to our giveaway post! Next week we'll unveil the four giveaway winners, AND we'll give out a few awards to #FallFitDog participants! Hope you all had fun with the challenges! Rocco looks like the guy in charge of his group! He is always such a funny fellow! He is certainly a funny fellow! We think we'll practice that exercise this week too! We had so much fun participating in the Fall Fit Dog Challenge-thanks to all for hosting such a fun event! Love that last picture of Rocco with his canine pals! Thanks for joining us! Loved reading about what you all did, too! Fun is what we're all about! Yay, Buzz-boy got featured :-) Tiffany's backyard circuit looks cool, and so do the pups Schooner & Skipper (literally, in the cooling H2O), and of course Rocco and his K9 entourage! Yay for Buzz! Love his tricks! Thanks for hosting the event! All the dogs look thrilled to be out hiking. We're going to check out what Bella was up to now. I also love the swimming dogs, having a pool for our dogs is my dream! This was a fun challenge and we really enjoyed being motivated by other active dogs like Rocco. Thanks for joining us! We wish we had our own pool too. A good time was certainly had by all!